For over twenty five years Fiona has built up a global reputation in textile design, mainly in home furnishings and household products. Her own company produces fine furnishing fabrics for kitchens and various Household applications. She is most well-known for her contemporary 'Sanderson's Dandelion Clocks Print'. Fiona is a British designer, trained in Middlesex and now works between her Brighton studio and her Los Angeles studio in Venice beach. Her rug collection is inspired by her love of contemporary fabrics and distinctive colour pallets often seen in her work. 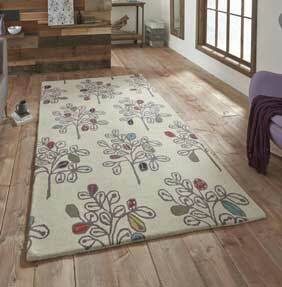 This designer collection is handmade from a blend of 50% wool and 50% viscose. The stylish patterns and super high quality make for one hard to ignore range. Designs include, Money Tree, Harlequin, Echo and Windfall. Sizes are 120x170cm, 150x230cm and 180x270cm.